Thanks Crissi and the Press Democrat! This entry was posted in book review, books, Indie publishing, Publishers Weekly, writing and tagged book publishing, book reviews, Current Events, family, guns, investigative journalism, journalism, Law, national news, nonfiction books, Publishers Weekly on January 6, 2017 by Mike. 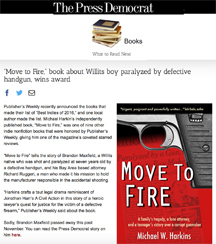 This entry was posted in book review, books, Indie publishing, Publishers Weekly, self-publishing, writing and tagged book publishing, books, nonfiction books, Publishers Weekly, writing on July 22, 2016 by Mike. 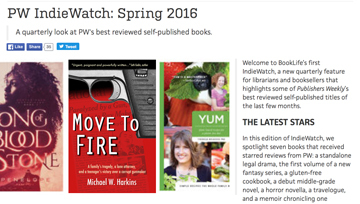 Move To Fire was at the top of the featured books in Publishers Weekly’s first every IndieWatch list! This entry was posted in book review, books, guns, investigative journalism, Publishers Weekly, writing and tagged book reviews, Current Events, guns, investigative journalism, Law, nonfiction books, Publishers Weekly, Publishers Weekly starred review, Society on July 21, 2016 by Mike. Brian Fies is a personal and professional friend. His review was unsolicited and, frankly, unexpected. With his permission, I included this part of his review on the book’s Amazon Page: “…like a legal thriller…the suspense is compelling. 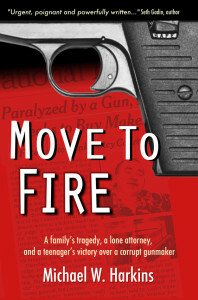 Move to Fire isn’t an anti-gun screed. Move to Fire is a passion project by a writer who knows how to mine facts, build characters, and use them to tell a terrific story. I found it an engrossing, well-built narrative that pulled me through, page by page.” — Brian Fies, award winning author of Mom’s Cancer and Whatever Happened to the World of Tomorrow. This entry was posted in book review, books, current events, guns, law and tagged book reviews, books, Current Events, gun violence, Law, nonfiction books on July 20, 2016 by Mike. I’m grateful for all of these. This entry was posted in book review, books, guns and tagged books, Current Events, gun violence, Law, nonfiction books on July 20, 2016 by Mike. This entry was posted in book review, books, current events, guns and tagged books, Current Events, family, gun violence, nonfiction books on July 20, 2016 by Mike.